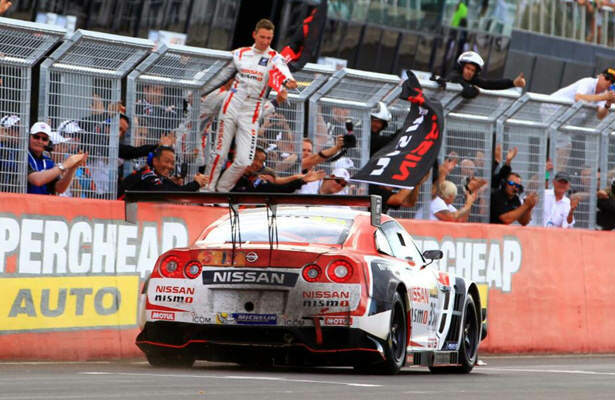 Nissan took a stunning win at Sunday’s Liqui-Moly Bathurst 12 Hour in a thrilling final two lap dash. 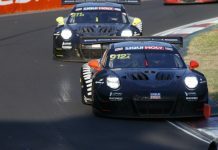 After 12 hours and a record 20 cautions, five different cars representing five different manufacturers still had a shot at the Mount Panorama win. However, with two laps to go Katsumasa Chiyo driving the #35 Nissan GT-R NISMO GT3 powered past the #15 Phoenix Racing Audi R8 LMS Ultra of Laurens Vanthoor completing the pass before Hell corner. Chiyo then locked his sights onto the leader, the #10 Bentley driven by Matt Bell, and, just a few moments later saw the Nissan GTR, nicknamed ‘Godzilla’ dispose of the Bentley to take the lead and begin to pull away. As ‘Godzilla’ bolted away, the fight for second and the ‘best of the rest’ stepped up a gear. Vanthoor continued to push his Phoenix Audi, drawing alongside Bell’s Bentley at every opportunity all the while defending from Stefan Mucke who was snapping at his heels in the #97 Craft Bamboo Aston Martin Vantage V12. Somehow, clearly under huge pressure, Bell managed to fend off the Belgian’s attack until the final corner when, running a little wide, the Bentley fell from second to fourth as Vanthoor and Mucke seized their opportunity and muscled their way past to take the final two podium places. The #36 Erebus Mercedes SLR rounded out the top five. 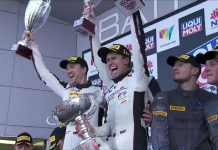 Nissan’s win marked a monumental victory for the Japanese manufacturer, claiming its first win at the New South Wales mountain circuit since 1992. Furthermore, with two of the three drivers, Wolfgang Reip and Florian Strauss coming from Nissan’s GT Academy stable it proves the validity of the manufacturer’s ‘gamer to racer’ concept completely. For what may be the first time in a major GT race, seven GT3 manufacturers were represented in the top-seven overall, with the #49 Vicious Rumour Racing Ferrari 458 Italia GT3 and #32 JBS Australia Lamborghini Gallardo completing the top seven. 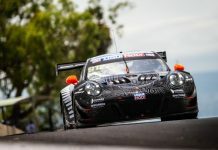 Of the 50 starters, 34 cars finished the race, which saw a weekend attendance of 32,200 spectators, an increase over the previous year despite clashing with the pre-season V8 Supercars test in Sydney. Full provisional results are available here.